When I use Inka the Spider’s “Play/Reap:” ability, can I target a creature that is already stunned? Yes. However, because a stunned creature cannot become stunned again, no additional stun card is placed on the creature and the ability is resolved with no effect. Can armor prevent a creature with the Poison keyword from destroying its opponent? Yes, but only if the armor completely absorbs the damage from the creature with Poison. Poison only destroys a creature if at least 1 damage is successfully dealt during the fight. Damage dealt by other keywords or abilities does not trigger Poison. 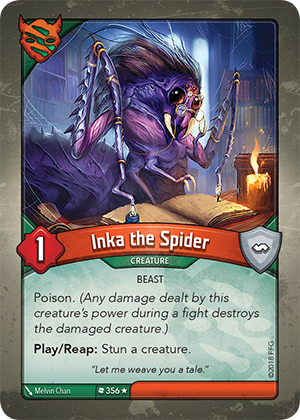 If I use Inka the Spider’s “Play/Reap:” ability and there are no enemy creatures in play, do I have to stun a friendly creature? Yes. This effect is not optional, so you must always choose a creature to stun. If Inka the Spider is the only creature in play, it stuns itself.